1. What significance does Ishikawa see in the popular Edo legend, “The Tale of the Maidservant Otake” (Hijo Otake no setsu)? What are the “urtexts” for this legend (and senryū)? What does Ishikawa mean when he says that “the novel idea of transforming some lowly Sakuma housemaid into the Dainichi Nyorai never would have occurred to anyone had the Noh play Eguchi and the popular tales about Saigyō (1118-1190) and Courtesan Eguchi not preceded it”? 2. Ishikawa identifies in this essay five “transformative devices” (tenkan no sōsa) that make up the process of haikaika (haikai-ification)—a process he sees as running through all art forms of the Edo period. The first “device” he identifies is mitate. Explain this concept/technique. How does it function in the Otake legend? How does this technique connect the Edo-era maid Otake to the famed prostitute of antiquity Lady Eguchi, and also the “young, wandering rake” who solicits sexual services from Otake to “that old, itinerant monk Saigyō”? 3. Ishikawa believes that modern man has lost the ability to understand/appreciate “Tale of the Maidservant Otake” and other “haikai” narratives. Explain his reasons for thinking this. 5. The third “transformative device” Ishikawa discusses is yatsushi (lowly disguise). Explain this notion/technique. What does Ishikawa mean when he says that Otake is the yatsushi of the Dainichi Nyorai, and that the Otake legend is the yatsushi of the Buddhist doctrine of dependent origination? 6. Why does Ishikawa think that “it is the Edoites—and not, as most scholars assume, their descendants—who truly deserve the label of ‘modern’”? Discuss the “modern” qualities that Ishikawa sees in the Edoites but finds lacking in his own time. 7. Most literary histories explain the transition from Matsuo Bashō’s haikai to Ōta Nampo’s kyōka/kyōshi as a decline in the haikai movement. Ishikawa challenges this history by insisting that the Tenmei kyōka movement was in fact the ultimate expression of the haikai spirit. Why does he think this? 8. The fourth “transformative device” Ishikawa describes is honkadori (allusive variation). What does Ishikawa say about this notion/technique? How did Ōta Nampo and others revolutionize the practice of honkadori in the collection Wild Poems of Ten Thousand Generations (1783; Manzai Kyōkashū)? Explain. 9. According to Ishikawa, Matsuo Bashō made a revolutionary discovery in the Genroku period that paved the way for further inventions/innovations (hatsumei) in the Tenmei era. What was this discovery? How did the Tenmei kyōka poets inherit/build on this discovery? 10. Ishikawa describes the Tenmei poets as “absent from their sobriquets (kyōmyō).” “In other words,” he continues, “they were anonymous personas, writing yomibito shirazu, or anonymous, poems. The haikai linked verse of Bashō made us forget the presence of the author the moment of its formation—yet the compilers of Wild Poems took this one step further by erecting a whole world from this renunciation of authorial name/persona.” Discuss the significance of this passage. How is this notion of “erecting a whole world from the renunciation a authorial name/persona” radically different from the credo of most modern writers? 11. Ishikawa asserts that all modern hermeneutic modes completely miss the point of haikai. What are his reasons for thinking this? Why does Ishikawa regard mimetic modes of reading as inadequate for understanding/appreciating the “haikai imagination” (to borrow Haruo Shirane’s phrase)? What alternative mode of reading is required? 12. What classical anthology served as the basis/urtext for Ōta Nampo’s Wild Poems of Ten Thousand Generations? Why was this particular anthology used? 13. The fifth “transformative device” Ishikawa discusses is his neologism—hon-shi-dori. Discuss this concept/technique. What anthology of Chinese poetry served as the basis/urtext for kyōshi? Explain the relation between this anthology and its genkai (colloquial explanations)? How does Ōta Nampo parody Wang Changling’s (698-795) poem “Parting with Xingjian At Hibiscus Inn”? What “negotiations” (kōshō)—another key term of the essay—occur between poet-reader/past-present in this poem? 14. Consider the following passage from the essay. What does he mean by “invention/innovation” (hatsumei)? How is the critical standard of hatsumei different from the critical standard of “craftsmanship”? Which does Ishikawa prefer? By evaluating Edo poems capriciously and in isolation, we remove ourselves from that original urgency which characterized the Tenmei Edoites’ method of reading. The genius of Tenmei kyōshi was articulated through innovation/invention (hatsumei); hence it would be foolish to jump headlong into a debate about craftsmanship in kyōshi, which, unlike the native art of kyōka, is derived from Chinese poetry. 15. 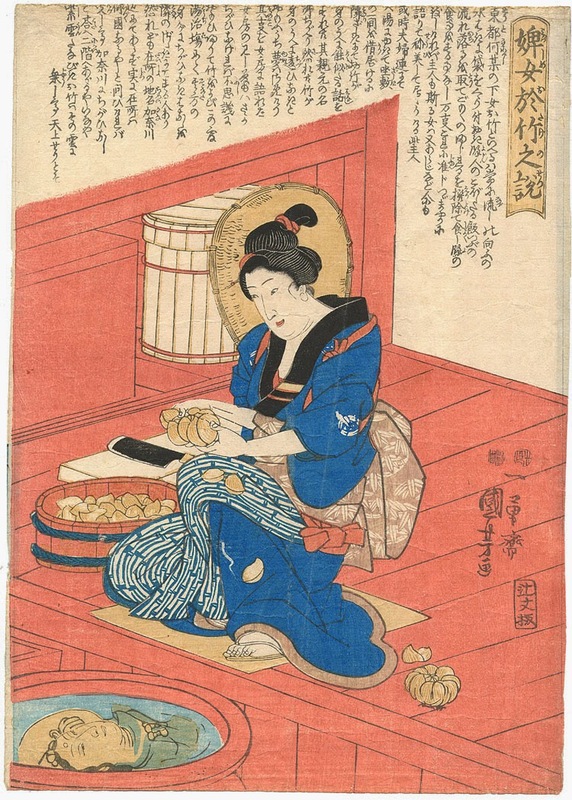 Ishikawa cites an episode from Santō Kyōden’s sharebon Shigeshige Chiwa (1799) in which the author refashions Cui Guofu’s melancholy poem from Selection of Tang Poems into a humorous contemporary poem about a client at a brothel. Describe the similarities/differences between the two poems. How does the new version reflect the Genkai (colloquial explanations) of the Selection of Tang Poems, which was popular at the time? 16. Haikaika is built on the interplay between shukō (twist/innovation/device) and sekai (thematic base/classical setting). This interplay/reframing is only effective if the audience/readers are familiar with the original sekai. How does Ishikawa describe the importance of cultural literacy/familiarity in the medium of haikai? What has happened to this cultural literacy in the modern period? 17. Although the explicit subject of this essay is “the thought patterns of the people of Edo,” its implicit subject is the thought patterns of the modern age. Explain how this essay is a disguised critique of the dominant aesthetic/hermeneutical modes of modernity. How does the framework of “haikaika” serve for Ishikawa as one possible alternative to these dominant modes? “On the Thought Patterns of the People of Edo” (Edojin no hassōhō ni tsuite). First published in the March 1943 issue of the journal Shisō. Translation (by me) forthcoming. For the original, see Volume 12 of the Ishikawa Jun zenshū (Chikuma shobō, 1989). Very good questions - they really make you think. I almost regret that I don't know Japanese literature and culture good enough to answer those questions. What could you recommend to read to start my acquaintance with Japanise literaure?